Earlier this week, my sister made these healthy homemade granola bars for her and her fiancé. I have not had the chance to bake these bars yet, but I have full intentions of doing so this weekend. My sister said these granola bars were delicious. 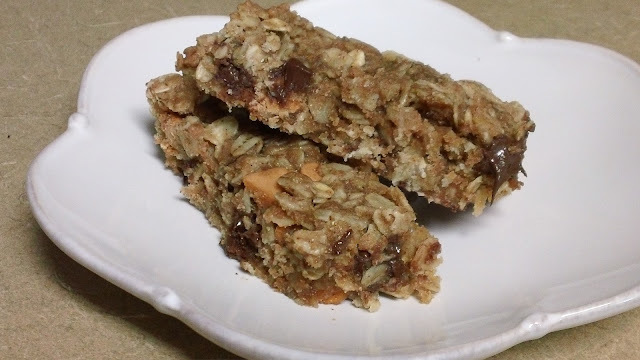 The rolled oats, whole wheat flour, and wheat germ make them healthy, while the brown sugar, honey, and chocolate & peanut butter chips make them sweet. What an excellent snack I look forward to eating soon! 1. Preheat oven to 350 degrees F. Line a 9 x 13-inch baking pan with foil and spray with cooking spray. 2. Mix the dry ingredients in a large bowl. In a small bowl, mix together the wet ingredients. Pour the wet mixture into the dry and mix well (it’s easiest to just use your hands). Pat the mixture out into the foil-lined pan. 3. Bake for about 15-20 minutes if you want chewy granola bars or for 20-25 minutes for crunchy granola bars. When the edges start to brown, remove from the oven and let cool for a couple of minutes. Use a pizza roller to slice bars. Finish cooling completely before removing from the pan or they will break apart.